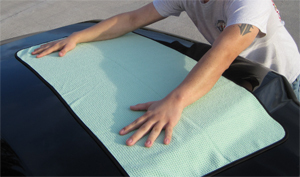 The Supreme Guzzler Waffle Weave Microfiber Drying Towel by Cobra is a medium size drying towel for cars, compact trucks and SUVs. Microfiber cleans, it scrubs, it polishes, it dries - it's the multipurpose miracle fabric! Could there possibly be a way to improve upon our Cobra microfiber towels? Of course, there's always room for improvement! Now our Cobra Supreme Waffle Weave has a silky satin edge to further protect your paint from potential scratches. We also gave it a new color, just for good measure. We call it The Supreme Guzzler! To save on production costs while maintaining a high quality fabric, the Cobra Guzzler microfiber was manufactured in Korea and cut and sewn in China. The Korean company uses a splitting machine to make what the industry calls "ultra microfiber" that's the soft, highly absorbent microfiber available from Cobra. Once this ultra microfiber is made in huge rolls, it is sent to China to finish the towels. The result is a premium towel at an affordable price. As if that weren't enough, the towel now has a silky satin edge all the way around! The strip of satin covers the threads where the fabric has been sewn to keep it from unraveling. A larger thread is used to bind the edges of the towel and it's not as soft as the tiny microfibers. The satin edge covers the exposed stitching to eliminate any risk of the thread scratching the paint. The softest fabric in the world just got softer! The Supreme Guzzler has the amazing drying and buffing qualities you've come to expect from Cobra with a new ultra safe satin edge. Dries better than anything else i've ever used. My truck, shower doors, house windows, etc. ProsGreat towel to dry anything! I have used these the last couple of years and they are terrific MF towels for dark paint. They will leave no streaking behind when used like some of the "fluffy" MF towels. I use the "fluffy" ones on light paint cars and they work fine but these are all I use on dark paint. 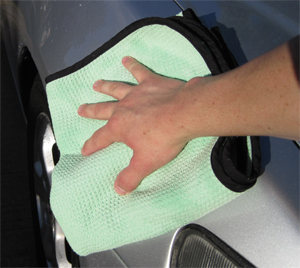 Had some other brand car drying microfiber towels and they did not perform anywhere near like the Cobra guzzler. They are a bit more money but are well made and work well. These work even better than I expected! How did I ever dry my car without them?